Like many women in the Passage, I rely on super-safe everyday neutrals. Then I see someone in an audacious mix, such as teal trousers and a fuchsia coat, I think, What happened to me? Two colours, pungent yellow and juicy orange, are especially current. Grown women rightly fear looking like a walking fire hydrant, but these hues are smokin' from the first glance, especially when you add a second or third intense colour. Today's windows are an advanced class in fearlessly working yellow and orange. If you prefer a smolder to smoke, they also spark your favourite neutrals; I can't believe how sharp mustard looks with any grey. Expensive! The bad news: The yellows look ghastly in average yarns. Co-stars: Yes, you do need to treat that shoe with TLC! The sweater will also revive neutrals. Citron suede day heel; Everlane, $145. If you can't wear yellow near your face, put it on your foot! Blackforest wool Imogen sweater; Boden, $130. Normally I avoid frills anywhere, but this is—if such a thing exists—a strict frill. Co-stars: The classic sweater in a novel shade; a scarf in an enchanting colourway. See it close-up! You can shift the colour wheel to blues or greens if you don't like yellow or orange—as long as they're not too pale to register a pulse. How you wear an audacious key piece depends on your colour capacity, and there is no "right". If you don't usually pile on intense hues, try at least one piece in the current citron-to-signal-orange and you will immediately feel its energy and exuberance. 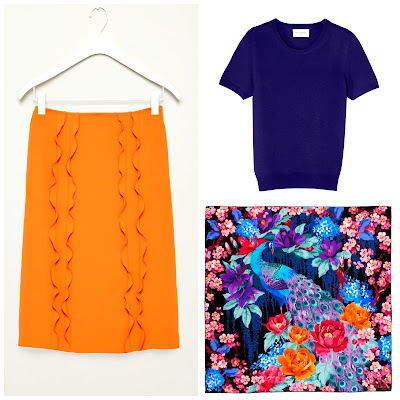 Are you daring or sparing, when it comes to the most vibrant tones on the color wheel? Are you cozying up to more colour, or committed to the neutral playbook? Have your colour choices changed with time? Can't say I love those colours - especially together. I love when I see a woman who carries it off but I don't think that's me. While I love colour, I tend to wear it as one pop with neutrals and then maybe a scarf to tie it all together. As you say, yellow is a very tricky colour to wear - and the shade shown in your post would do nothing for me! But hey - if you can carry it off - more power to you! Margie from Toronto: Thank you for your comment. Margie, you put me over a writer's block. This post was inspired by a woman (maybe 45?) who walked by me last Sunday morning in these amazing chartreuse patent boots, and deep purple jeans, big chunky grey turtleneck. Wow, I thought: relaxed and current. I had been thinking for awhile about what makes women look current and conclude with a queasy feeling that it's the neutral plus •one• colour thing in which I and so many of our age feel good. There is another way out of this very, very minor dilemma: choosing all-neutral or monochromes,(examples: ivory and black, three shades of grey, or olive with black). That's the look you see in Everlane's ads and most of us have the things to do that. We can still have the scarves. I need the scarf! I feel like the moment in the 1980s when I realized shoulder pads were over: "Now what?! And I pray this is not going to be expensive." I'm comfortable wearing brighter colors when I'm in Florida (I can always raid my mother's closet! ), but I don't like to wear them when I'm in Ireland, Paris or Chicago. That tells me something important! You've done a beautiful job balancing the colors and the overall outfits - brava! What I noticed on the streets in The Plateau - natural colors and fabrics, monochromatic, no prints except on the ubiquitous scarf. Walkable shoes! Of course, I pay more attention to the art/architecture. I saw a women in mustard pants and a neutral top in the grocery store and she looked gorgeous! I think color on the bottom half is a safer, more wearable look for most of us. I think Janice brings up a very important point: what colours look attractive vs lurid depends to a great deal about the quality of the light and the architecture. There is so much burnt orange on the walls of Rome that I bought items of that tone when studying there and never wore them at home. Jane, wouldn't that depend on her body type? Jane: I see mustard with cream, rose with cream, gray with cream: cram is the new black. Heh. But, I see very little black and red, for example, The more aggressive colour paired with black is, IMO, beginning to pass its sell-by date. I see young women in green blouses and mustard cardigans, bent over their notebooks in cafés and I love this anarchic non-corrodination. The yong woman across from me yesterday, in a black tee with purple jeans and the pink tips of her hair brushing her screen. I think the thing is to look less 'done'. Our women are spectacular at that, an offhand, not label driven sense of insouciant individuality. lagatta: We all have visceral responses to colour, associations that have not much to do with what we think we can wear. I am sure you were beautiful in burnt orange. And we should pay attention to them, because who wants to feel like she is wearing someone else's clothes? lagatta: Oops, to clarify my color on the bottom comment - bright orange and yellow are hard to wear close to my face. Over-powering on a nordic blonde gal. I think we can all agree - wear your, cream, black, orange, forest green or all the above with confidence. Confidence is beautiful. You know I love colour so this post made me very happy! I strongly believe that colour is one of the joys of life and that everyone can wear colour...you just have to find what's right for you. I used to look down on orange but over the past couple of years it's become one of my favourites, it has so much warmth and energy, especially during these dull damp days. That Liberty scarf is stunning, so rich and detailed. Thanks for the colour hit. I've been influenced by Janice over the last few years so I've been staying within a 2 neutrals/2 accent colour wardrobe system. I did, however, buy a colourful silk and mohair knit vest from Mohair La Pinède last week at the Circle Craft Fair and would greatly like a pair of those green velvet jeans to go with it. I do think that it takes a lot of confidence or insouciance to carry off a lot of bright colour. Ooh, yellow shoes! My mother bought a pair of yellow patent leather shoes and yellow tights for me to wear with a navy sheath dress. I was eight and I thought I was smoking. (Full disclosure, I still think it is one of my better looks!) I have loved yellow shoes ever since. The color drains all color from my face, though. 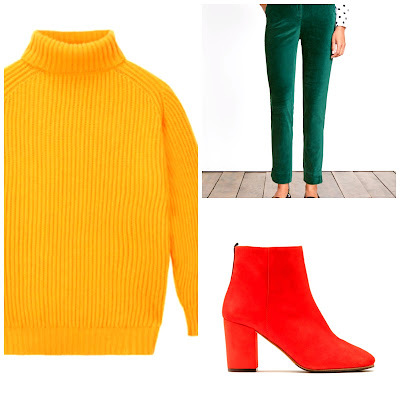 I've learned that I can wear almost any color, except yellow or lime green, as long as it is deeply saturated. (Is that the value?) I am also stuck in a navy, grey, black and white rut. 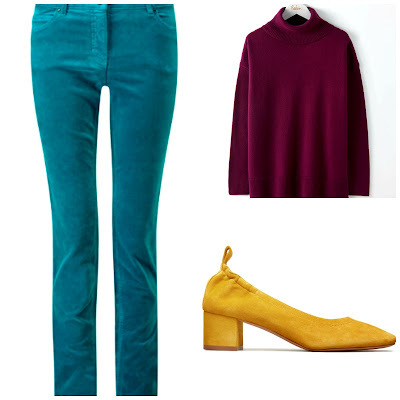 There is the odd pair of turquoise corduroy pants and burgundy sweater that I love, but my fear with a bright color below the waist is it would only emphasize my hips. They -the hips- aren't as perky and firm as days past. I think we are also trying to get more out of each garment, so crazy colors seem imprudent, no? But, winter sales are coming soon and a little journey outside the comfort zone might bring sunshine to a dark winter. I'm inspired. But, then I just received the alert of an upcoming Kojima sale. Damn. But yes, even this black-loving gal is wanting to wear more color these days. and I love orange, gold and rust colors. But just like plus-sized women not wearing colour, I think that's size-ist and limiting. I've seen some petite women like you, in two very contrasty colours between the top and bottom and they look great. I think all those 'rules' stem from women's dread of looking larger than they are. Leslie: Crazy colours are not imprudent, but may be impudent! (Could not resist.) Perhaps olive? Burgundy? My friend Lou came over in a pair of turquoise jeans and charcoal tunic with turquoise pendant, wow, great. She definitely has hips. Rita: Colour is a lift... I read an interview with Betty Halbreicht, the renowned personal shopper, and she recommended pink because she thought most older women look good in it (the right shade of pink- so many choices), but for others it's another colour. In general I' say that very harsh primaries and fluorescents don't look good on white-skinned older women, but women with dark skin can look fantastic in them. Fortunately that leaves an immense range for everyone.